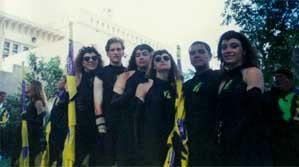 1994 brought good things to the drum corps. The corps had a solid winter program. The show choosen for the DCI tour was the music from the cult movie "Little Shop of Horror." Again, the same design approach used the previous year was used again, with even greater success. The colors to be used were green, white, and red. The emblem used to represent the show as a logo and on the various parts of the uniform was a stylized leaf. The corps doubled both its membership (50) and its touring schedule. Experienced college students, such as Peter Ward, Scott Patricia, and Hector Perez, and All-State caliber players such as Adrian Robledo, joined the corps and added a level of maturity in both leadership and in performance. The corps performed with a drumline (6S/3T/5B/4P) and a contraline (6) that rivalled the size of some Division I corps. The design staff continued to create a program that was both entertaining and increased in difficulty. In fact, it was this very fact that allowed Stuart Spoon to discover his love of beating garbage cans. Lone Star also moved its location to San Antonio with the promise of finacial support. Unfortunately this support was not long term (which was too bad because the staff really liked having staff meetings at Taco Cabana and Archie, Opus, Mike, and Marc loved eating those chicken fried steaks the size of John Rindom's head at that one place). Camps were held at Cornerstone Christian School. The corps performed at various standstills and parades, including at the Riverwalk (which was the prototype of the Drum Corps Preview now done in Austin) and San Antonio's famous Fiesta parade. The corps added Marc Cervantes, a San Antonio native. Marc was a former lead soprano from the Sky Ryders and Bluecoats. He was hired on the brass staff and was able to continue the work for Archie Endley when he could not be present. The corps on tour continued to amaze everyone. The judging community continued to be amazed at the show design and how well everything fit together. The drumline was actually outscoring many division one drumlines, which resulting in the timely sponsorship of such organizations as Pro-Mark Percussion, Dynasty Drums, and Lone Star Percussion. Both the corps and the show were huge crowd-favorites of the DCI tour. This was also the first year that members of Lone Star competed at DCI's I & E, including Adam Ashlock, son of one of Lone Star's co-founders. The corps ended the season at the DCI World Championships held near Boston, MA. For the first time in the corps' short history, it made the Division III Finals. The corps ended up taking 5th with a score of 84.8 and sharing the High Percussion trophy with the Mandarins from Sacramento, CA. Lone Star Color Guard in San Antonio. Note the leaf overlay that was used throughout the corps.